Successfully Added eKit International SIM Card with Free $10 Credit to your Shopping Cart. 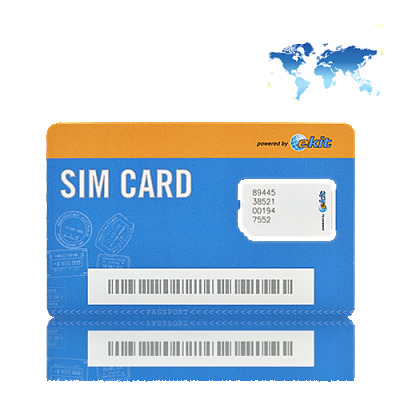 Travel the world and make/receive calls using only one SIM card - the eKit International SIM Card. Whether you're a leisure or business traveler, or a student off to study abroad, with the eKit International SIM Card you're covered in over 150 countries with an amazing low-cost local and international cell phone service. If you take several international trips per year or plan to make frequent calls back home, then the eKit International SIM Card is for you. Not only can you make local calls from where you will be and enjoy great savings on international calls, but the SIM card will work in over 150 countries! Making local calls and staying in touch with family and friends just got a lot easier. Make and receive local calls: You're in a new city and instead of buying a new phone and signing a contract for local cellphone service, the eKit is pathway to cellphone convenience when you need it. Make and receive inexpensive international calls: Save up to 70% on calls and stay in touch while you travel with the assurance that you are in control of your call costs using your prepaid account. Convenient 24/7 voicemail service: Family and friends can leave you messages at no cost to them! Retrieve your messages 24 hours a day, 7 days a week over the phone or even listen to them online. Recharge minutes anywhere and at any time: Simply recharge via the web, recharge over the phone using our self-service recharge menu, or if you prefer to speak to someone, call our 24-hour Customer Service. Alternatively, setup Auto-recharge and you'll never have to worry about recharging again! The eKit International SIM Card is your best option for local and international calling from anywhere in the world. With $10 of pre-paid credit, this SIM card practically pays for itself and is the ideal item to buy in bulk for massive savings. Order one for your favorite Chinavasion phone, then a few more for your online store and watch as the profit rolls in. Available now - order today and we'll ship it out tomorrow! Coverage in over 150 countries. No need to have a new phone or SIM card for each country you are visiting. Works with all Chinavasion phones! *Service in this country is currently being tested. The service is operational, but outages due to technical implementation are likely. If reliability of service is required, then we recommend purchasing a local SIM card for this country. ** Service in Japan & South Korea is only available if your cell phone supports 3G (2100). *** Please note that you cannot make outgoing calls from Kuwait, however you may receive them. You can send and receive text messages normally. The eKit International SIM Card will not work with locked mobile phones. "Locked" means that the phone is restricted by the network operator to work only on its’ own or affiliate networks. If your existing phone is locked, you cannot use a SIM card supplied by another network provider without unlocking your phone first. No cost to you when receiving calls when in France, Italy, Spain, and the United Kingdom! Will this SIM card work with my 3G phone, including iPhone, HTC Desire, Samsung Galaxy S, etc.? Yes! As long as your phone is unlocked, you can use the eKit International SIM Card! I'm traveling to _____ soon, will this work there? Most likely, but check the list of countries under "Manufacturer Specifications" first. You said this SIM card works in _____, but it doesn't! What's wrong? You will also have to make sure the phone you have can be used in the country. For more information, look up "GSM frequency bands". If the product is not used at all, the SIM cards will cease 15 months after date of purchase (date of purchase is the date when you receive the SIM cards from Chinavasion). This period is extended for another 15 months everytime the SIM card is used for a paid service (E.g make a call, send a text message). The credit one new SIM cards doesn't expire, once the SIM card is used for the first time, the credit expires 6 months after last use, this means that the credit is valid forever if the service is used at least once every 6 months. Is there any monthly/yearly cost in maintaining the card/phone number? No fees to maintain the SIM cards or numbers (there is a 50c monthly fee to maintain the US number but this is optional, the end user must select this online). If the balance is at $0 will that terminate the use of the card if not renewed with additional credit? As per #1 above, SIM card will cease if it is not used in a 15 month period.